Your front yard is the first impression anyone will have of your home and you should use it to make a statement. From the simple to the extreme, these front yard landscaping ideas will allow you to transform your front yard into something you’ll love seeing every day. No matter the size of your front yard or the size of your budget you can make something extraordinary. This simple but playful addition to your front lawn works best at night but even during the day, the cute watering can makes an impression. All it takes is a plant hanger, a few strings of LED lights and a watering can! This potted plant border allows you to easily change your front yard whenever you want! Just remove the pots and put in something new. Put plants and trees in the center of your lawn and surround with mulch to create a stunning island. By using plants and trees of different heights you can add dimension and character. By choosing one color for all the flowers in the yard this garden has a very cohesive look! The white flowers stand out against green grass and bushes for a truly elegant look. This one takes a little time and money but the result is worth it. Get some rock planters and then fill them with small succulents. The result is a desert oasis that is sure to be the focal point of your yard. If you want a yard that is pretty low-maintenance. This rocky, desert-themed front yard has minimal work and very little grass. It might be expensive at first but you’ll be grateful for how easy it is to maintain. If you really want a yard that is easy to take care of, try something like this. But putting low green plants throughout the front yard instead of grass, you can have something that looks great but never requires mowing. Planting some tall cone-shaped trees or bushes can be a great way to add some drama to your front yard and add some privacy to your front windows. You can also use along the pathway to your front door or just to accent your front door. 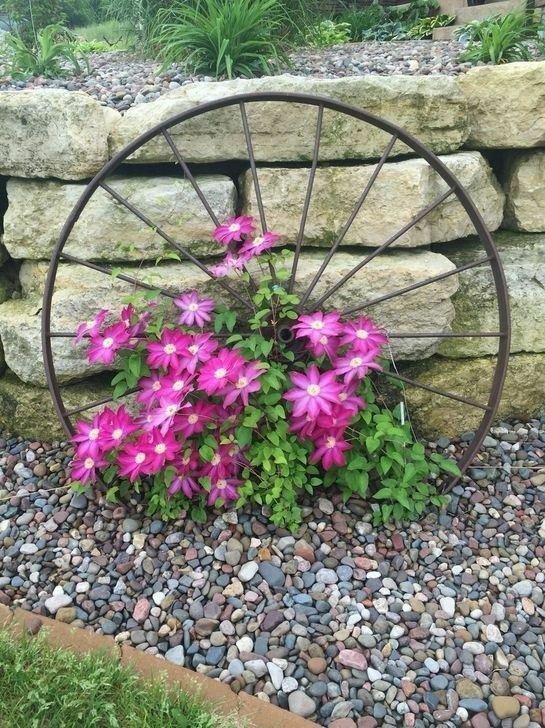 If you want to transform the look of a wall of your home or hide something from view, consider some flowering clematis. These gorgeous flowers easily climb up trellises and come in a wide range of colors. You can even make a rainbow of color to really make your yard stand out! Pavers can be a great way to add some character to your front lawn. This idea takes the pavers to make a chessboard design where some of the squares are pavers and others are small flowering plants or rocks. In the center is a beautiful fountain. Wildflowers are great because they are cheap and easy to grow. They also add tons of color to your yard and are great for attracting butterflies. You can buy them fully grown or buy a wildflower seed mix so you can be surprised at what comes up. Add some extra charm to the trees in your front yard by creating a circular planter and filling it with colorful annuals. This saves you from having to try and mow the grass around the tree and it is a beautiful addition to your yard. Pick a variety of colors and make a pattern for even more of a design element. Nothing gives a yard more character than turning something unique into a planter. This old-fashioned bicycle might be past it’s prime for riding but it is a perfect way to create a fun planter. Add some fun signs and it becomes a show stopper in any yard. Make planters of varying heights to add drama and dimension to your front yard. You can also use the planters to line a pathway to your front door if you have a yard that is on a hill. This idea transforms a hilly yard into something spectacular. This unique yard uses pavers to create alternating lines down the front of the yard. Potted plants accent the lines and allow this yard to be changed regularly if desired. It might be harder to mow but it is striking to look at even from a distance. Water features might be a lot of work to start but they are an undoubtedly gorgeous addition to a front yard. 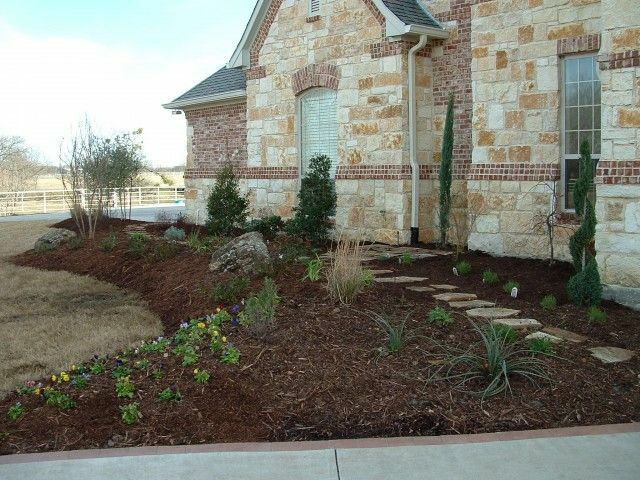 This one lined with plants and featuring a rocky path down the front of the yard is the focal point of this home’s curb appeal. This monogram planter is easily made with a bit of wood and some annuals but it makes a show-stopping impression. If you have the wall space in your front yard this is definitely something to consider. Add some colorful flowers or small green plants to match whatever you already have in your yard. These boulders not only add dimension to the front yard but they are striking and add a sense of the mountains. This is great if you live in a mountainous or rocky area or if you just want a yard that has less maintenance. Evergreen plants like junipers are amazing. They are so low maintenance that they are actually hard to kill once they are established. Just plant them and they’ll keep your yard looking great with very little watering. A great way to add a modern look to your front yard is with some spheres. These can be added anywhere in the front yard to make a bold modern statement. Have a tree stump in your yard that you don’t want to dig up or grind down? Turn it into something beautiful by making it into a planter and a focal point for the yard. Who knew it could be so easy to turn an eyesore into something beautiful? This wine barrel planter design is too cute and so easy to do. Just use a wine barrel turned on its side and plant flowers in the wine barrel and outside the barrel to look like they are being poured out. Make a statement by making a row of flowering trees and circular flowering planters. Make the flowers from the trees and the planter complement each other and it completely transforms the look of your front yard. Anyone can make a pathway with pavers and gravel. Go for something with a little more rustic character by using old boards. These boards give the feeling of railroad tracks and become a focal point of the yard. Draw the eye upward with some planters overflowing with petunias. Since petunias come in a variety of colors you can pick some that complement the rest of your yard or some that stand out against more neutral colors. Flowers aren’t the only way to add color to your front yard. Coleus plants come in a variety of colors and they have the benefit of not needing replanting or regular maintenance. Even your mailbox is an opportunity for some color. Consider a few flowers around the base of your mailbox. Additionally, you can get some low bushes or climbing vines to cover up the entire bottom of your mailbox. With some pavers or gravel and some raised flowerbeds, you can make an elegant courtyard. Add in a water feature and some topiaries and you have a front yard that looks like it belongs in front of a castle. If you live in a tropical area there is just no going wrong with palm trees. They not only make a big statement in your front yard but they are pretty effortless to maintain. Two stone columns and large potted mums just set the stage for this front yard. Then a pathway lined with small topiaries makes you feel like royalty just walking down the front path. Definitely, a cheap way to make a big impression. Outline your front yard with flowerbeds of various heights and colors. This design takes evergreen plants and pairs them with simple white flowers to make an elegant look to the yard. Even a sign with your house number can be an opportunity for some flowers. A simple hook and a hanging flowerbed transform a simple pole into something beautiful. Lighting your guests’ way in the dark can be a focal point for your garden even during the day. These gorgeous lights are beautiful at night but even during the day, they add a decorative element to the front yard. Concrete planters may be a bit expensive at first but they pay off with less work and a modern statement in the front yard. With big planters like these, you won’t have to worry about ever mowing your front lawn and you can easily change the look of your front yard whenever you want. Alternating colors of flowers is a great way to bring your whole yard together and add your favorite colors. You can either choose bold and bright colors or colors that complement the home. A small front yard doesn’t mean you’re limited to just a few plants. This front yard has a variety of plants shoved in a small space to add plenty of color and character. Two potted topiaries add just a touch of elegance to a front yard that looks more like a secret garden. This bright brick house is the perfect background for a yard full of color. The red mulch ties the front yard in with the house and makes it all come together. If you want to get color to last through the fall, you can get some cold-tolerant flowers. These flowers are accented with decorative kale and are a great replacement for dying spring and summer flowers. If you already have a fence or even if you don’t, adding an archway to your front walk can be a charming addition to your curb appeal. Adorn the archway with flowering vines or roses and you have something that is absolutely beautiful to look at and walk under. 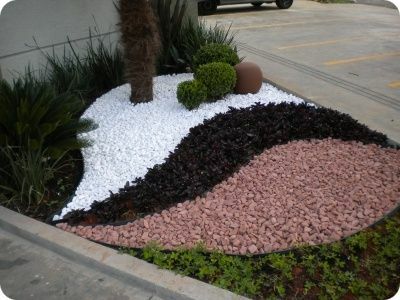 A simple way to trim your flowerbeds is with rocks. They will give you a strong border to mow around and provide a way to keep mulch where it belongs. Even better it really stands out and makes a statement in any yard. This is a simple way to create a focal point in your flowerbed. 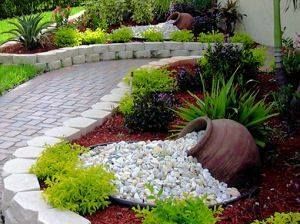 Overturned pots are very popular in yards and you can put your own twist on it by having rocks spilling from the pot. For a front yard that makes a statement but is very low maintenance, consider doing a design with different colored rocks. You can do this anywhere in your yard and it really makes a big impression. This large flower bed is big enough to incorporate a path and a range of plants. It is easy to keep up as long as you stay on top of the weeds and reduces the amount of grass you need to mow. Instead of using rocks or bricks to line your flowerbeds, consider using low evergreen plants. This can grow almost like a garden maze but stay low enough to allow all your plants to be seen. If you have a fence it is the perfect opportunity to add some gorgeous roses to your garden. Well cared for roses love to climb around fences and once they grow as tall as the fence it creates a beautiful addition to your front yard. While it might not be in the budget for everyone, a large water feature can transform any front yard into a lush oasis. The sounds of running water create a peaceful ambiance to your front yard and make it welcoming to everyone who walks by. If you have a classic or beautiful front façade of your home, sometimes it is best to design your front yard around the home. A few simple trees and flowers can let the house take center stage and elevate your curb appeal with minimal cost and work. This yard is filled with color and the window boxes on the first and second story blend the house into the colorful garden. This is a great way to tie the house into the garden and draw the eye upward as well. If you really want a yard that is low maintenance go for rocks and succulents. Succulents require little to no upkeep at all and very little water. They survive just about anything and will add a pop of color against white or grey stone. This may seem simple but in the middle of a flower bed or against a wall it really stands out and gives a bit of rustic charm to your front yard. A pop of color from a flower draws the eye to the old-fashioned wheel. If you want to add some height and dimension to your yard but don’t want to build your own walls or planters, these are a great solution. Pre-made planters are at most hardware stores and are easy ways to transform your front yard. Even if you just have limited space for your front yard, with a bit of time you can still make something extraordinary. This urban oasis has a rock garden and a variety of shrubs to make this front yard look anything but small. If you live in an area prone to drought then you might want a garden that can survive without a lot of water. You’d be wrong if that means you have to sacrifice color and style. This garden is filled with low water plants but still looks bold and beautiful. A unique way to highlight your plants in your flowerbed is to use a stone circle around them. This lets you pick a variety of different plants and have each one showcased on their own. Surrounding the bed with low-growing plants adds to the effect. This is a great way to bring some of your garden up close to your home and around the windows. Flower boxes with trellises allow you to pair vine growing flowers with low growing perennials or annuals for a beautiful vintage look. Just because you don’t have any space for a front yard doesn’t mean you have to go without one! This wine barrel is transformed into a miniature garden with a range of plants and complete with a vintage style light. Sometimes it’s not just how your garden looks that matters but how it smells. This archway is covered with sweet-scented jasmine and it looks like something out of a fairytale. The overgrown look of the ferns helps with the secret garden feel. Sometimes a trellis can be a bold statement as well. This trellis has the vine growing along it in a unique diamond pattern that really draws the eye. It turns a boring wall into something quite stunning. Light up your flowerbeds and your pathway with some outdoor LED strip lighting. It gives the effect of a glowing pathway and creates the perfect evening ambiance for your front yard. Adding some birdhouses to your front yard not only make an adorable addition with their rustic charm but with a little bird seed they can also bring some winged guests to your home. There is nothing better than seeing happy birds flying around your garden and enjoying the bird houses. There is nothing that brings the streets of Paris or a vintage feel to your front door than a uniquely created paver pathway. This one with flowering trees and simple plants feels like a European courtyard and is absolutely gorgeous to look at. Who said you had to have a fence around the whole front yard? 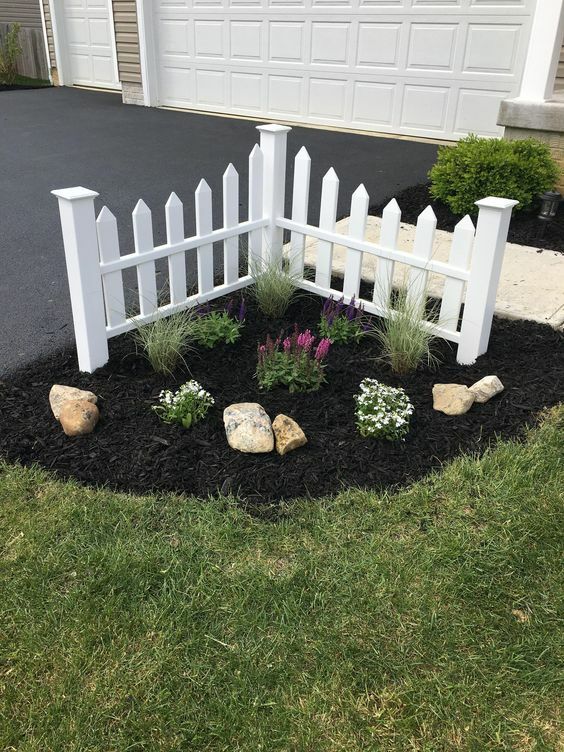 This cute little fence makes a great focal point in the yard and brings to mind the cherished idea of a home with a white picket fence.